If you scroll down to my previous post(s) you can see the progress I've made since the last time I showed you. - I love THIS idea for kids (well, adults too, to be truthful!). Thanks Judy for this one! - HERE is a really sweet banner you can make for Valentine's decor. - I'm not a football fan (apologies to those who are) and I know this is Super Bowl weekend, but I have to say that I absolutely love THIS commercial! I have watched it over and over and it tugs at my heart every single time. Today's quote is from Einstein..."Creativity is seeing what everyone else has seen, and thinking what no one else has thought"
Brrrrr - in more ways than one! Each pair of mittens required three different sweaters as well as a wide strip of ribbing for the cuffs, plus they're lined with either fleece or velour (thanks be to recycled housecoats!!). I can usually get three pairs of mittens from each sweater, depending on the size of the sweater and how I cut them. The hardest part is finding the wide ribbing for the cuffs. So...twelve pairs of warm mittens....done! - THIS is a rather interesting process. Not sure I would ever attempt it, but the results are fun. - THESE are for inspiration only, but there are some great ideas! - Cute little notions bag tutorial HERE. - If you have bits of yarn in your stash, perhaps THIS pattern might be just what you're searching for to use it up. - I don't think I've ever noticed anything that was particularly for Groundhog Day, but I have to admit that THIS made me laugh....almost too cute to eat! - THIS is a handy little tip for those of us who use paint. I haven't tried it myself, but it sounds as though it would work well. Today the quote is from Mark Twain..."Shut the door - not that it lets in the cold but that it lets out the coziness"
Just to prove that there's something else that's been happening here at Chez Magpie other than cleaning/shoveling/backhoeing and sewing, how about a dinosaur sweater that I just finished? I usually knit or crochet in the evenings in front of the tv so this is the result of two or three weeks of evenings. Pattern came from a Beehive booklet called 'Knit Menagerie' and Ravelry has it HERE. - I like THIS planner for crochet (which could work just as well for knitting projects). - THIS is something a lot of us really need! I have a similar one that is soon going to bite the dust so I will be keeping this tutorial handy! - THIS is a handy little zippered pouch - and there's a link to two other sizes as well. A set of three would make a lovely gift! - Now THIS is something I could really get behind!!!!!!! - If you enjoy paper piecing perhaps THIS might be a fun project to create for Valentine's Day. - THESE links to lots of bag-making tutorials should keep you busy for a little while! Today's quote is from Elizabeth Zimmermann..."Properly practiced, knitting soothes the troubled spirit, and it doesn't hurt the untroubled spirit either"
directly here on the blog now and not via email. Be sure to check the previous post to see them! - You'll have to use the 'translate' feature for THIS, but it's another fun way to create words using wire. - There's a really sweet needle book tutorial HERE. - And THIS is a nice tote bag tutorial too. And THIS is a great tote for your sewing supplies. - Have a look at the amazing embroidery done by THIS artist! - If you have some fat quarters in your stash, perhaps THESE might give you some ideas. - THIS is something else that I came across that I think is an amazing idea. Another anonymous quote for you today..."Once you've made the decision to move on, don't look back. You will never find your future in the rear view mirror"
Yes, finally! I started working on a new fabric landscape and I'm happy to get back to it. I guess I have to call it a landscape now rather than a barn! It's at the stage now where I debate chucking it all and starting over, however I know I go through this every time so I will work through it. That's not to say that it will end up escaping the trash bin eventually anyway, but at least I have the patience to wait and see! - I love THIS - I'd never do it, but I love it anyway. - For those who like to carry a few tea bags in your purse, THIS is a cute little holder (would make great gifts too!). - THESE are rather cute and would be fun for Valentine's Day. - THIS is a really pretty honeycomb stitch pattern that could see many uses. - There are some great ideas for organizing your crafting space HERE. It's been really cold here the past few days (but happily we seem to have missed the big dumping of snow that many people got). Right now it's -24C here and it was colder than that over the weekend, particularly if you factor in the wind chill. So the quote for today is this..."I think it's time for Old Man Winter to get Mother Nature drunk, and have a little fun making Spring"
Yesterday I had to go to the dentist - not something that's high on my list of things I want to do, but this time I was dragging my heels even more than usual. I was scheduled to have a tooth removed, which isn't something anyone looks forward to. The dentist, upon further perusal of my x-rays, couldn't see any issues with the tooth and he was concerned that I might have something called 'pain transference' (which means the pain is coming from somewhere else and not where it seems to be manifesting itself). I came home with my tooth intact and we have adopted a 'wait and see' approach. I know it's postponing the inevitable, but I'm enough of a wuss that I'm perfectly happy to put it off. Today I will share the final project made from that piece of quilt I had in my stash. I decided I would make a table runner that also featured some hunks of old doilies for additional interest. That particular decision served a dual purpose - it not only used up the rest of the quilt, but also led to a reduction in the amount of lace I had. Sort of a win/win! picture of a table runner! wavy, as they appear here! - Have a peek at THIS cute kitty tote pattern (thanks to Joan from Moose Stash Quilting blog for the head's up on this one....and be sure you check out the great version she made of this pattern in her blog post HERE). - THIS is a really cute idea for decorating for Valentine's Day (or you could use individual ones for gifts I think). Scroll down for the tutorial. - Sometimes I come across a little tip that makes me wonder why on earth I hadn't thought of it myself. THIS is one of those things (and of course you're all going to tell me that you've been doing this absolutely forever and it's me that's behind the times!). - I can see so many uses (beyond what is intended) for THIS bag. - THIS would be so handy to carry in your purse! I think you could add a small handle and use it if you only had to carry a few things. Today your quote is from Ann Landers...."Blessed are they who hold lively conversations with the helplessly mute, for they shall be called dentists"
This was created using an orphan block which I subsequently added more 'gee haws' to. You can embiggen the photos if you click on them so you can see further details. Here's a question for you - do any of you happen to know of a tutorial that can be found online to create a carrier that you could use to tote a single place setting of dinner plate, cutlery, etc.? I'm searching for ideas and thought making something like this would be useful for when you have to tote along your own dishes for a potluck. Any ideas...or have you made one? - Be sure to scroll down to see all the amazing eye candy HERE!!! - THIS is a really cute storage box you can make (NOTE...there's an additional pattern piece to be found HERE). - And THIS is a wonderful organizer that would be handy for so many purposes. And THIS one too! - THIS is a great tote bag - perfect to use up some of those jelly roll scraps you have lurking in your stash! - Sandy of Quill Cottage Studio is posting videos of her progress on the 'Just Junk Journal' challenge and you can see her first post HERE(and can follow her subsequent posts as she goes along). Today's quote is courtesy of Maya Angelou..."You can't use up creativity. The more you use, the more you have"
Well, it's not done yet! Seven atc's seemed to manage to get made out of it too. Do you suppose there might be anything else? I haven't talked about books here for quite awhile, but I've just finished reading two that I thought were worth sharing. Most of you will remember having seen the famous photograph taken during the Vietnam war of the little naked girl running in the road after having been horribly burned by a napalm bomb. Kim Phuc was that little girl and she has written the story of her life in a book called 'Fire Road'. My friend and I went to hear her speak just before Christmas and she has had an incredible life. She's an amazing speaker and her book is one I highly recommend that you read. ('Fire Road - A Memoir of Hope' by Kim Phuc Phan Thi, ISBN 978-1-4964-2429-7, c 2017). The other book is fiction, but written in a very factual way. It's the story of Alice who, at 50, was diagnosed with early-onset Alzheimer's disease. Her story of her gradual descent into the disease is at times hard to read (probably, in my case, because both my mother, my mother-in-law, and a sister-in-law had the disease, and currently one of our friends is dealing with it) but gives you a good insight into the gradual decline that the disease causes. ('Still Alice' by Lisa Genova ISBN 978-1-5011-064-2, c2009). - For some eye candy featuring etui's, have a look HERE. - if you would like to make your own etui, HERE is a tutorial for one. And another is HERE (scroll down to see all the steps). - I don't normally share a picture without knowing the source (and if you know who made this, please let me know so I can give proper credit) but I wanted to share it anyway. 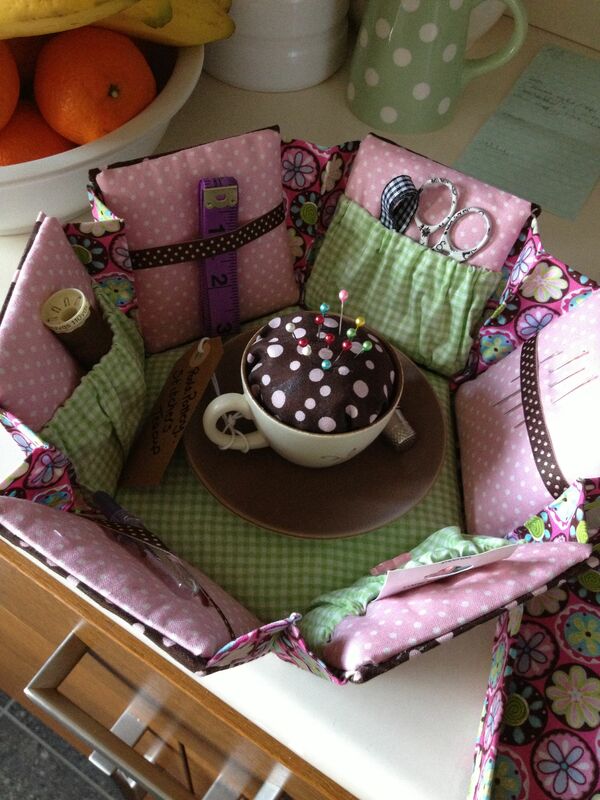 Have a look at THIS etui - I love the pincushion!! - If you have an over-abundance of fabric scraps (not that ANY of us do!!!! ), perhaps there might be an idea for you in THIS lineup of projects. Today, a quote by Albert Einstein..."Creativity is seeing what everyone else has seen, and thinking what no one else has thought"
- I don't know about you but I often struggle with attempting to turn a small fabric tube right side out...and there's a tutorial HERE that might help with that. - Nice tutorial HERE to make your own etui box. - HERE is another cute pattern that would be fun for Valentine's Day decor. - And if you go HERE you can find links to a whole lot more! - Have a look at the work by THIS artist! Be sure to check out all her galleries. Amazing! This morning it's -18C outside (brrrr!) 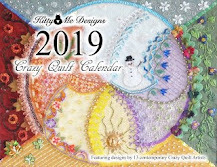 not including the wind chill which makes it much colder....so I found this quote that seems fitting for the day..."I'm not going outside until the temperature is above my age"
A cover - of the crazy quilt sort! And now, just to prove I haven't given up on crazy quilting, how about this pillow cover that I just completed? You can see a small influence of the Cathedral Window quilt pattern on this piece - a challenge I thought might be fun after having seen several other people 'round and about the internet making them. - HERE is a cute project you might like to make for Valentine's Day. And there's another great pattern HERE. - THIS is a rather nice pattern for slippers, but I think I would add something to the soles to make them non-slip. And HERE is another one. - There's some fun ideas HERE for creating lots of things using zippers. - Pam Kellogg has created some really pretty Spring-themed cross stitch patterns and you can find out more by checking out her post found HERE. - Mary Corbet has released a really cute (free!) embroidery pattern HERE. - If you check out THIS link you will find all sorts of really pretty flowers you can make to enhance your projects. - Have a look at the works done by THIS artist (be sure to check out her other galleries as well). Another anonymous quote..."Life is so ironic. It takes sadness to know what happiness is, noise to appreciate silence, and absence to value presence"
Eleven bookmarks. Use part of quilt - check. Use exactly all 11 'harvested' pieces of doily (flowers) - check. Fussy cut bits of lace from a larger 'bit' - check. Use bits of pink ribbon from stash - check. Now, I wonder what else I might be making with that quilt?? Stay tuned! The Resident Taste Tester has pronounced it good! - I'm sure many of you have made something similar to THIS, but I rather like the combination of denim and fabric scraps. - HERE is a really cute edging you can use if you're making a fleece blanket. - Go HERE for some fun eye candy (be sure to check out the other galleries too!). - There's an interesting article HERE about the various uses of freezer paper in your sewing room. - There are some really great ideas HERE for organizing in your sewing room. Today's quote is from St. Francis of Assisi..."He who works with his hands is a laborer. He who works with his hands and his head is a craftsman. He who works with his hands and his head and his heart is an artist"
I was just typing a response to a comment that Sherry left on my previous blog post and it occurred to me that perhaps what I'm doing might be of benefit to some of you. Some of you may know that I'm a compulsive reader of organizational books and may also know that not a whole lot of what I've read has sunk in and been acted upon, mainly because it's too difficult to be bothered with...or, just simply doesn't work. Just prior to Christmas I found this book at the local library and couldn't resist reading it ('Decluttering At The Speed of Life - winning your never-ending battle with stuff' by Dana K. White). The boil-down of the book for me was the thought that everything in your home should have a 'container' and anything that doesn't fit in that so-called container does not have a place in your life (there are many different definitions of what qualifies as a container). For some reason that thought struck home with me and has sparked the current shovel-out of my sewing space, and has overflowed into other areas of our living area as well. As an example - I have a Rubbermaid tote that has been overflowing with lace 'bits' for more years than I care to count. I have NO clue how long it's been since the lid would actually shut on that silly container. And it's not the only one!! So....I dumped it out and went through it all, piece by piece, and got rid of a lot that I knew I would never ever use (but was keeping, just in case a major miracle happened). Now, wonder of wonders, the lid works (who knew?)!! The simple premise in the book is that from now on no new lace can be added to that container without getting rid of something out of there so that it will never overflow again. Simple. Easy. Doable. The book is very readable and filled with great suggestions, so I highly recommend it. Now, onward to the next container! along with a fancy button from my stash. created from that chunk of quilt! 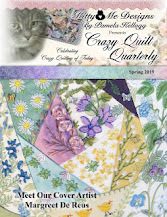 UPDATED TO ADD: Kathy Shaw has announced registration for her FREE online beginner's crazy quilt class. Go HERE for further info (and you only have a couple days to register so don't miss it!!). - Amazing eye candy HERE (be sure to check both galleries!). - I can see numerous uses for THIS freebie - it's just so pretty!!! - And for sheer jaw-dropping eye candy, have a look HERE (and be sure to scroll down). - Check out the post HERE that has lots of links to great free printables for organizing in 2019. - The San Francisco School of Needlework and Design has announced their latest challenge "Borders" and you can find more information at THIS link. Today's quote..."Friends are like the walls of a house. Sometimes they hold you up. Sometimes you lean on them. But sometimes it's enough to know that they're just standing by"
Over the past few days I've been undertaking my yearly deep shovel-out of my sewing space. It's still ongoing but at least there's been some progress. I would like to know why, though, that nothing looks as if it's changed!!! - THIS is a nice pattern for a knitted scarf. And there's THIS one too! - HERE you can find dozens upon dozens of free sewing patterns. Enjoy! - Wow! Have a look at THESE for eye candy!!!! And they're fabric! - THIS is a fun project (thrift store shopping, anyone??). Link goes directly to the PDF pattern. Today is another anonymous quote..."Four things you can't recover....the stone after the throw, the word after it's said, the occasion after it's missed, the time after it's gone"